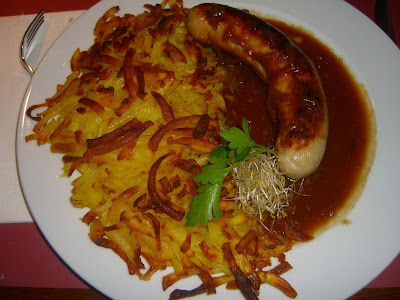 Another Swiss accomplishment that I enjoyed many a time is the good ole bratwurst and rosti. The local Olma bratwurst is memorable for its smooth tenderness brought about by a mixture consisting predominately of local veal and milk. A saucy onion gravy meets the rosti halfway across the plate. 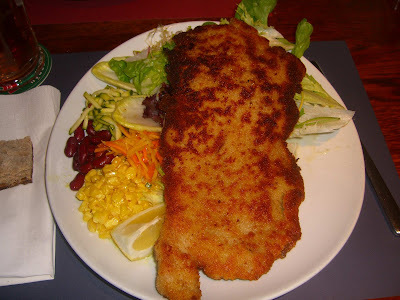 While the classic Swiss German specialties are always a treat, the region is no stranger to more exotic fare. An unexpected dinner celebrating Phil’s graduation melded the foreign flavors of India and Africa with familiar vegetables and meats. 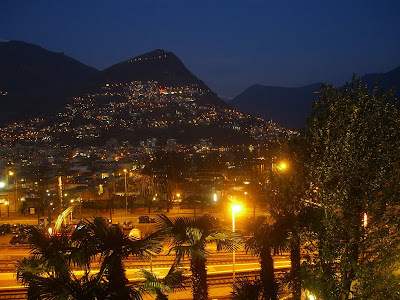 After experiencing the German and French parts of the country, I was anxious to visit Italian Switzerland. A three hour train ride south from St Gallen brought us through mountains, ravines, and picturesque towns. 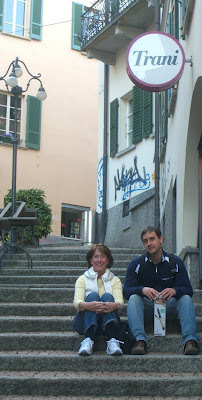 Upon arrival to Lugano, our growling bellies were rewarded on via Pessina, where a well-known salumeria sits directly across from a well-stocked cheese shop. 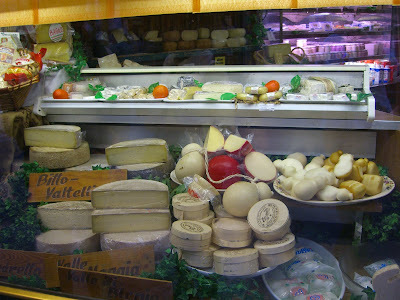 While I remained across the street and drooled at the cheeses on display at Gabbani, bottega del formaggio. I’d heard good things about Vacherin Mont d’Or, a soft cheese in a round wooden box decorated with Swiss flags and wintry scenes (in the middle of the shopfront window). It’s made only in winter and I would have purchased a box if only I could have guarantee of refrigeration in our hotels! 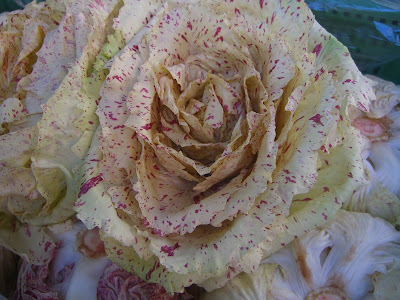 ... and pink-flecked lettuces. On our climb back to the hotel, we noticed a cute restaurant called Trani and decided to return there for dinner. 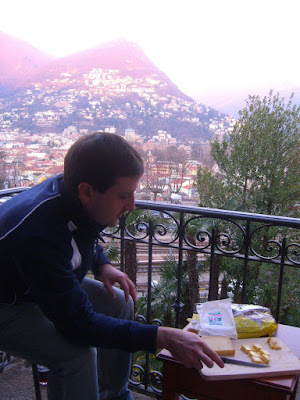 But first, it was cheese and wine on our hotel balcony to watch the sun set over the lake. 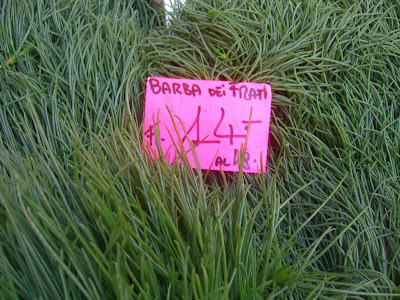 Restaurants all over town were advertising their seasonal asparagus and artichoke menus, signaling that spring had indeed arrived. 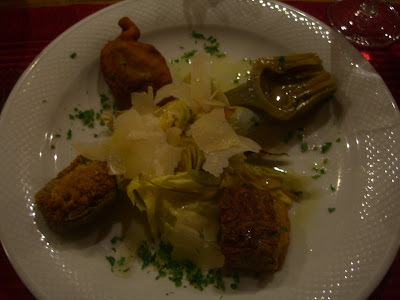 At Trani, we chose a simple dish of asparagus with shaved parmesan and a plate of artichokes five ways. I wanted to try risotto al salto to see if it was as good as the version I make at home. 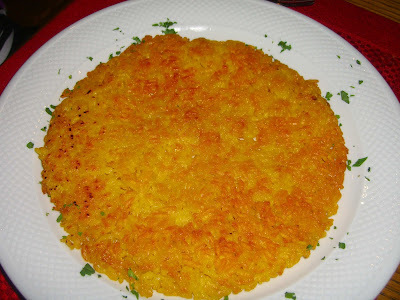 The name literally translates to “jumping risotto,” presumably from the way the rice jumps out of the pan as you flip it in order for it to brown and form a rice pancake. The risotto al salto at Trani was a bit too thin and dry for my taste, so I think I’ll continue to make thicker, smaller cakes at home in order for them to crisp on the outside but remain moist in the center. 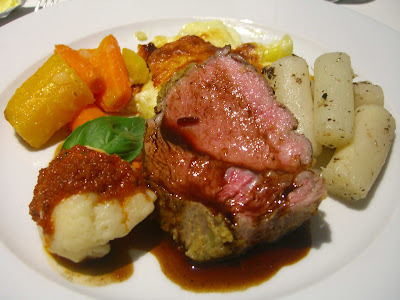 All-in-all, it was a fitting meal to end my time in Switzerland – simple preparations and fresh, seasonal ingredients in a warm, comforting atmosphere. Wow...I have a lot of reading to catch up on! All of your meals looked awesome. Curious if you tried the pink-flecked lettuce or if you know what it tastes like? 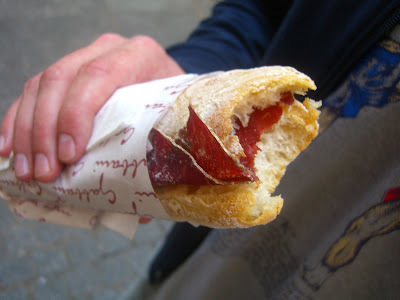 I love this post--it captures what I love about traveling in Europe. You don't need to research good restaurants or shops. You can literally just go somewhere and be knocked down by how simple and amazing the food is (and not have to eat at a McDonalds or Taco Bell!). Excited to read more! Where are you both after wedding? I always enjoy reading your bbogs. Especially your photos are terrible. I know both of you enjoy your lives. Recently I have been a member of Nova in Japan again and enjoy its voice room!! 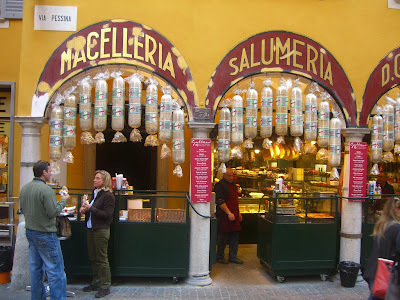 This is the perfect blog for anyone who wants to know about the food and travelling. You know so much its almost hard to argue with you.